Consumerization of IT has brought touch devices such as iPhone and tablets to the office – the once standard Blackberry with its clicking keyboard is no longer the default device of a mobile worker – and users are getting more accustomed to swiping and tapping to get the job done. As touch has become the primary user interface technology for mobile devices, evolving from single-point touch to multi-touch gestures, a recent report from market intelligence firm Tractica suggests the future of mobile devices lies in multi-modal user interfaces. If history is any indication, enterprises are going to be affected by a worker’s need to do more than type, click and swipe. The report, which focuses on mobile devices, said touch will remain the primary interface in smartphones, tablets, and smart watches, while haptic – physical feedback to the user through vibration – will also remain widely used. But voice is on the rise, according to Tractica principal analyst Peter Cooney. According to Tractica’s report, “Emerging Interface Technologies for Mobile Devices”, voice-based technologies are the most important area of growth for mobile user interfaces, and there’s both well-established and emerging use cases, such as virtual digital assistants (VDAs), hands-free use, and always-on interfaces, that will drive increased use of speech recognition technologies. Cooney said productivity is key factor influencing the adoption of voice interfaces, citing call centers and banks as early adopters. The latter could take advantage of voice recognition for voiceprint identity of an individual user, which will also be a key growth area for mobile device interfaces. The market intelligence firm forecasts that different emerging interface technologies will reach the following attach rates in mobile devices by 2020: speech recognition, 82%; localized haptics, 45%; gesture recognition, 37%, voice recognition, 36%; touchless/3D touch, 28%; and, eye tracking, 18%. The Tractica study examines a range of interface technologies, dividing them into current and emerging interfaces, and identifies trends and challenges. Touch sensors, for example, are increasing in accuracy and lowering power usage, gradually making the touch interface better, while at the same time, new film technologies are set to revolutionize the touch interface by adding improvements such as 3D touch. On the hardware front, processing power is increasing, audio components are providing better resolution, and image sensors are lowering power usage, all aiding the growth of new user interface technologies, while software is considered just as critical and even more important, as operating system (OS) vendors are adding native support for new interface technologies and OEMs are developing their own interface technologies. 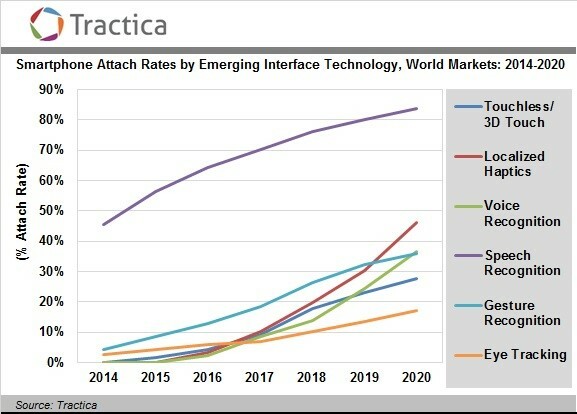 Tractica sees touch and haptic technology continuing to be the most widely implemented technologies, with growth in line with device market growth. Aural technologies will be adopted rapidly over the next three years, as they are reaching maturity. Visual technologies still require advances to be made in hardware and software before they are widely adopted in mobile devices. Tractica is just now digging into research on how enterprises will be affected, Cooney said, but expects to publish a report in July. An upside for IT departments is that voice technologies are pretty much getting baked into commonly deployed operating systems, he said. 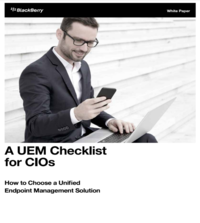 For now it would appear that CIOs should set aside budgets for hardware refreshes to support the types of interfaces users have come to expect, while enterprise application developers will need to accommodate new ways of accepting input. The findings of the Tractica research would indicate that Microsoft was ahead of time with its Windows 8 hybrid OS that accommodates both touch and typical inputs such as mouse and keyboard. The upcoming Windows 10, redesigned with user feedback, will continue the trend of offering a unified experience on PCs, tablets and phones.